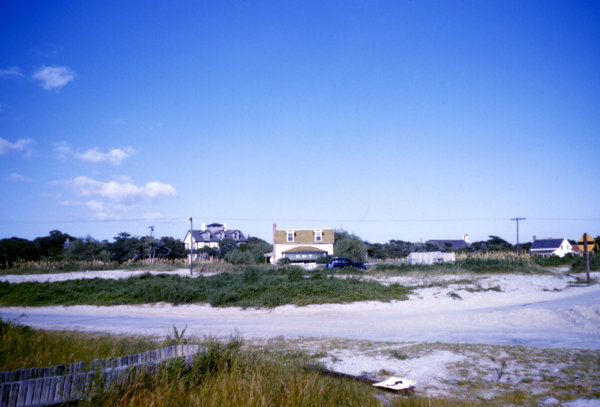 This photo was taken from the harbor side of the intersection of N.C. Highway 12 and present day Silver Lake Drive. In the center of the image you can see the building that sits behind the Island Ragpicker and the Slushy Stand. To the left you can see the G.G. Howard house and to the far right you can see the Bragg-Howard house. You can also see another building in the picture. See if you can figure out what building it is. I can't wait. What is the other building in the picture? Just to the left of the Bragg-Howard house, you can see the roof and steeple of the United Methodist Church.